In the late summer of 2013, Portland Bolt manufactured custom 1½” diameter, galvanized A325 heavy hex structural bolts for the Las Vegas High Roller Ferris Wheel located between the Quad and Flamingo resorts. Currently only the rim of the wheel is standing and is scheduled to be completed in early 2014. 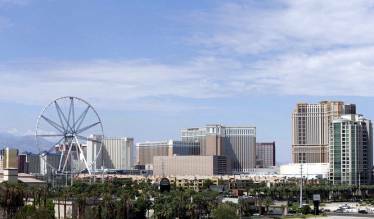 In true Las Vegas fashion, this will become the world’s largest Ferris Wheel at 550 feet. Portland Bolt was able to supply these custom galvanized A325 bolts in six working days due to our extensive stock of blanks that we have on hand as well as our in-house galvanizing. When your project needs a quick turnaround on custom sized headed bolts, we stock hex headed blanks and square headed blanks in A307A and F1554 Grade 36, as well as heavy hex headed blanks in A325, A449 and F1554 Grade 55.